Waiting on Wednesday is hosted by Jill at Breaking the Spine . Waiting on Wednesday is a weekly event meant to showcase the not-yet-released books that we are eagerly awaiting. 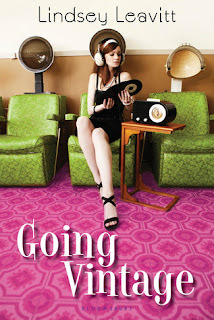 This week, we are showcasing: Going Vintage by Lindsey Leavitt. When Mallory discovers that her boyfriend, Jeremy, is cheating on her with an online girlfriend, she swears off boys. She also swears off modern technology. Inspired by a list of goals her grandmother made in 1962, Mallory decides to "go vintage" and return to a simpler time (when boyfriends couldn't cheat on you online). She sets out to complete grandma's list: run for pep club secretary, host a dinner party, sew a homecoming dress, find a steady, do something dangerous. But the list is trickier than it looks. And obviously finding a steady is out . . . no matter how good Oliver (Jeremy's cousin) smells. But with the help of her sister, she'll get it done. Somehow. This book looks absolutely adorable. And by that I mean the story, not the cover... the cover is a bit cheesy.. Ahahaha... But it seems refreshing to me. I've kind of been stuck in a fantasy/dystopian/sci-fi rut for a while now, and I really think I need to expand my horizons as to what I read. This seems like it will be a cute, light read, very much contrasting to the heavy, serious topics in the past few novels I've read.